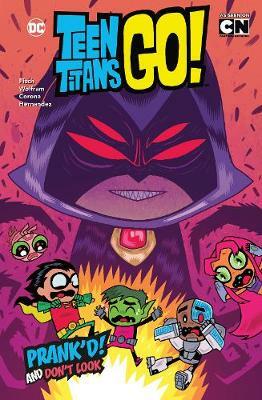 How do the Teen Titans kill time in between missions? By making prank calls, of course! But what happens when Beast Boy prank calls . . . Batman?! Then, when a mysterious package arrives for Raven, the rest of the Titans work themselves into a frenzy wondering, What's in the Box ... read full description below. How do the Teen Titans kill time in between missions? By making prank calls, of course! But what happens when Beast Boy prank calls . . . Batman?! Then, when a mysterious package arrives for Raven, the rest of the Titans work themselves into a frenzy wondering, What's in the Box ?! Bitten by a radioactive typewriter, Sholly Fisch has spent the wee hours writing books, comics, TV scripts, and online material for over 25 years. His comic book credits include more than 200 stories and features about characters such as Batman, Superman, Bugs Bunny, Daffy Duck, Spider-Man, and Ben 10. Currently, he writes stories for ACTION COMICS every month, plus stories for LOONEY TUNES and SCOOBY-DOO. By day, Sholly is a mild-mannered developmental psychologist who helps to create educational TV shows, web sites, and other media for kids.